Have you ever been reading along in a book when a statement hits you right between the eyes? That’s how I felt when I read the words highlighted above. That is ME. At the end of the day, I feel satisfied and fulfilled when I can look back and measure how productive I’ve been. However, if most of the items aren’t crossed off my to-do list (and there may be more than one list), I feel like I’ve failed for the day. I’ve written about this issue before, but there’s clearly still room for improvement. My personality type is a firstborn, perfectionist, people-pleaser who is motivated by checking things off a list. Accomplishment; that’s what fuels my day, gives me purpose, and makes me feel successful. I am addicted to measurable productivity. There’s nothing innately wrong with accomplishing things, but I have to remember to prioritize people and relationships, especially those in my family. Talking over our day with my husband or helping my daughter with a project or writing an email to a friend takes precedence – and I need to resist the temptation to add those items to my list so I can cross them off! Many important things don’t have a measurable value. Take prayer, for instance. Yes, I can see God answer prayer in the here and now; but I may not see the effect of many prayers that I pray until we’re in heaven. Neither can I measure the impact of a smile to a stranger or a kind word to a friend or a card of encouragement to a fellow church member. It’s helpful to set goals, to plan for the future, and do the best that I can to serve my family and my Lord. I believe God made me the way I am for a purpose and this trait can be used to further His work…if I just don’t allow my to-do list to turn into an idol I worship.. Accomplishment for it’s own sake can’t be what drives me. I have to allow the Lord to direct my days and learn to yield to whatever He has planned…whether it’s on my to-do list or not. Do you struggle with this like I do? Omigosh, yes!!! This is 100% me, too!!! I LOVE to-do lists, but I don't make a daily list. I make lists that relate to specific things, but they don't necessarily have a deadline (like daily ones often do). For example, I have a to-do list specifically for sewing, and it might take me a week to get through it, or it might take me a few months. I don't stress about a time-frame to complete it in. I also have a to-do list for planning for school, and projects – but again, they usually don't have a specific time-frame they have to be completed in. This way, I remember the things/projects I want to get through and I can work at them without it becoming a success/failure goal. I always feel achieved about my list because I steadily work through it without pressure. For daily stuff, I don't usually need a to-do list, because our days and weeks pretty much follow a pattern/routine. Occasionally I do a list for Saturdays – which is often our extra chores day, but I rarely fail to get through it on the day because it's my routine to do those extra chores on Saturdays anyway! Does that make sense? I used to struggle with this more than I do now. 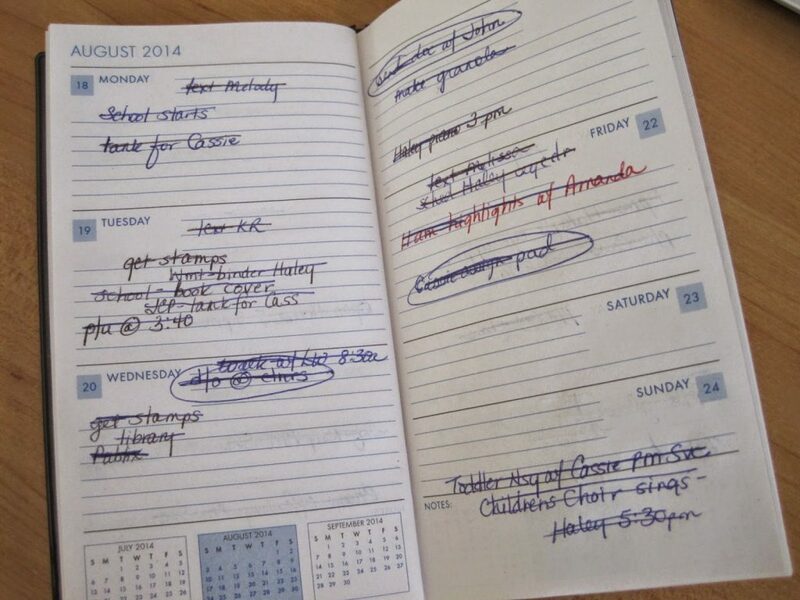 Having foster children means that I need to be more calendar oriented than task orientated, which can be good and bad. It's good because I am much more flexible and have learned to not sweat the small stuff. BUT, I can only take *so* much before I feel like I have lost control of the house and then the lists start again. I'm really working on it!